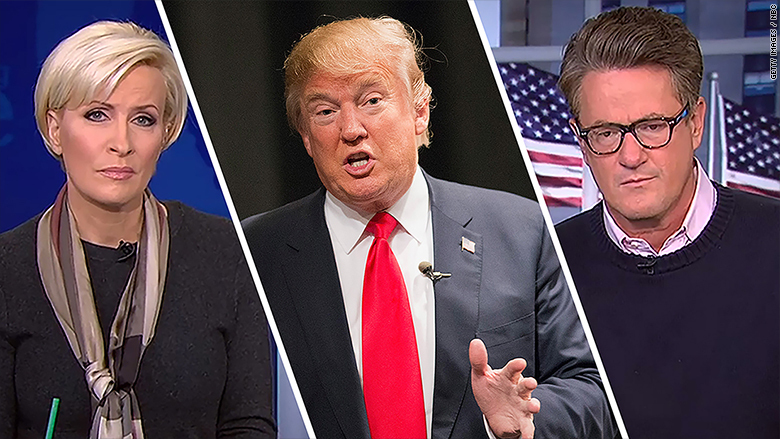 A 'hot mic' caught friendly banter between Donald Trump and the hosts of "Morning Joe." A newly released audio recording of Joe Scarborough and Mika Brzezinski's off-air conversations with Donald Trump has reignited concerns that the MSNBC co-hosts are too cozy with the Republican frontrunner. The conversations, which took place during the commercial breaks at last week's MSNBC "Trump Town Hall" event, feature the three talking jovially about the success of Trump's campaign, his likelihood of winning South Carolina and Nevada, and the ineffectiveness of his opponents' attack ads. At one point, Brzezinski tells Trump that she had "a wow moment" when he brought two men up on stage after they had removed a protester from a rally. Trump responds: "I saw it, I watched your show this morning. You had me almost as a legendary figure." The audio, which was obtained by comedian and radio show host Harry Shearer, offered the latest evidence that the "Morning Joe" co-hosts are too friendly toward Trump, which has become a source of discomfort at NBC. Network insiders have chafed at what they described as Scarborough's "over the top" and "unseemly" admiration for the real estate magnate who is leading the GOP field. MSNBC declined to comment on the tape. Shearer played the recording on his show to let listeners decide whether or not Scarborough and Brzezinski were "in the tank" for Trump. His own take, upon the conclusion of the recording: "You can cut the adversarial tension there with a knife," he quipped. "A butter knife, but still." Throughout the tape, Trump asks Scarborough and Brzezinski to weigh in on his campaign tactics, his poll numbers and the effectiveness of his opponents. "They're spending $75 million on negative ads against me over the last two weeks. Are they catching on at all?" Trump asks at one point. "No, doesn't look that way," Scarborough says. "What do you think?" Trump asks Brzezinski. Scarborough and Brzezinski immediately drew criticism from other journalists and media figures on Twitter after the tape was published online. Steve Deace, the conservative radio host, called it "clear coordination/coaching between a national show and a campaign." One portion of the tape that received criticism on Twitter was misleading. It features Brzezinski saying, "You don't want me to do the [questions] on deportation?" to which Trump replies: "That's right. Nothing too hard, Mika." However, sources at MSNBC said that Brzezinski was speaking to her producer Alex Korson and that Trump was voicing his approval of the decision from the sidelines.